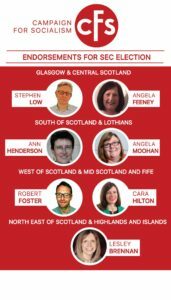 The Labour Left in Scotland have won five of the eight places on the Scottish Executive Committee. The successful candidates were Lesley Brennan, Angela Feeney, Ann Henderson, Cara Hilton and Stephen Low. Commiserations to Robert Foster and Angela Moohan who missed out. Campaign for Socialism is an autonomous left faction formed in 1994, originally to defend Clause 4. It holds the Momentum franchise in Scotland, branding itself as ‘Campaign for Socialism – Momentum Scotland’, and its candidates are strongly pro-Corbyn. Its achievement of 5 out of the 8 CLP places on the Scottish Executive Committee is an important one, more so when set in context-at the previous round of elections, it did not win a single place. The results are doubly significant because they represent a defeat for Kezia Dugdale, whose stranglehold on the SEC is now much weaker. The focus for internal activity now moves to the Scottish Labour conference in Perth later this month, where the Trade Union delegates are to be elected by block vote. The left are hopeful about a strong result in this section too, though changing the political composition of the 31 member committee will be a difficult task, given the large number of places held by the elected representatives section. Support the Left candidates for Conference Arrangements Committee and National Constitutional Committee! The Scottish Labour conference starts on Friday 24 February. That’s the day after Copeland and Stoke by elections. Will it be the same day as Corbyn resigns? Hope the left gains more as the ‘Born Again’ Fake Social democrats – the SNP can only be beaten by left wing democratic socialist arguments and policies. Funny at my last branch meeting a Right winger even tried to blame Corbyn for Scotland (when Labour there ran to Blairism and oblivion) but how come the SNP didn’t win this time outright? Under mediocre Dugdale it had been forced to move a little to the left (but not far enough). Lesson need a new left leader – little change, little gain, big change, big gain! You remind me of the BBC coverage of the Olympics. You aren’t interested in the overall result- just which of your preferred candidates won. I voted for JC as leader after he stated something Ramsay Mac wrote in 1911 “Socialists don’t attack people they attack ideas”. Valid in 1911, valid in 1916, valid now.